I finally saw The Fault in Our Stars on Tuesday night! I fell in love with the soundtrack weeks before the movie hit the theaters, so I had a feeling it would be an awesome movie. I really felt like the movie did the book justice. Although, some parts of the book were not translated to film, I felt the actors really stayed true to the characters in the book. One of the first outfits Hazel wears in the movie is this baggy, over-sized long-sleeve shirt with sweat pants and a jean jacket. Her outfit shows that she doesn't really care about what she looks like and she doesn't put much effort into her appearance. 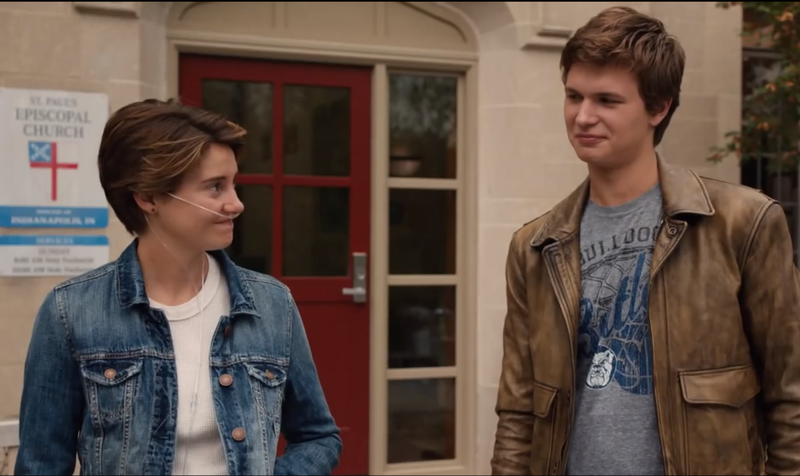 Also, Hazel is pictured wearing this jean jacket in multiple shots before meeting Augustus (Gus). To me, the repetitive shots of her in this jacket represents her dull routine lifestyle of doctors appointments, watching reality shows, etc. 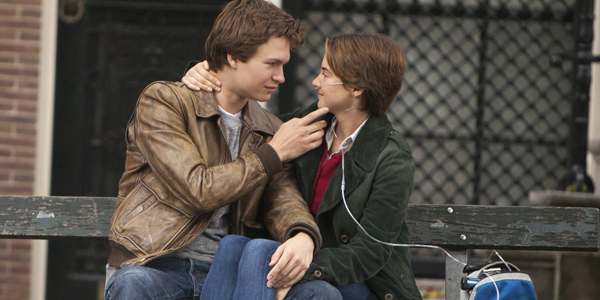 After Hazel meets Gus for the first time, her wardrobe becomes a bit brighter. The outfit she wears while waiting for Gus to call her is very simple: a graphic tee, jeans, and Converse shoes. Even though her outfit consists of mainly dark colors, there is a splash of reddish pink color on her shirt. This glimpse of color is a metaphor that Gus has already started to brighten her world with his infectious personality. As Hazel and Gus' relationship begins to blossom, Hazel continues to wear brighter pastel colors such as yellow and lavender with a peep of pink. Her clothing is still loose, but her shirts show off her figure a bit more. 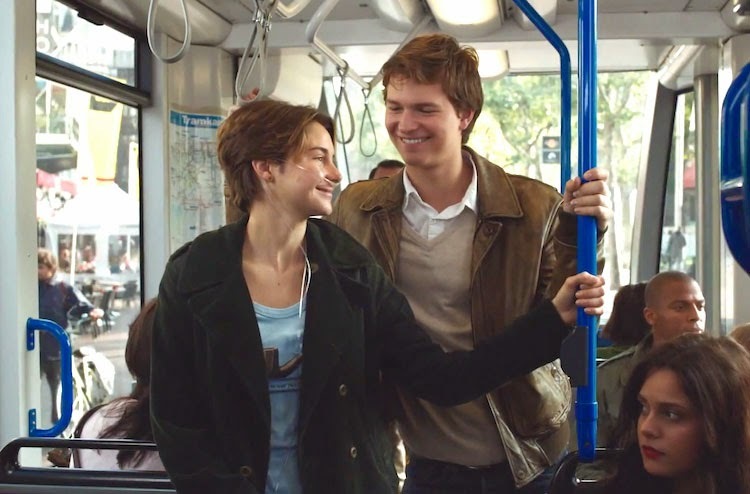 Above is a picture of the outfit Hazel wears when Gus tells her that they will be traveling to Amsterdam to meet the author Peter Van Houten, who wrote her favorite book, An Imperial Affliction. However, after Hazel is rushed to the hospital due to a build up of water in her lungs, she is crushed because the doctors tell her that she is too ill to travel to Amsterdam. To reflect her loss of excitement for life, she reverts back to wearing loose and baggy clothes. 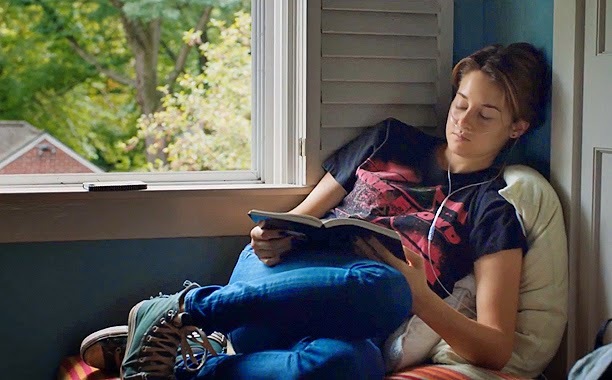 I have to say, the scene when Hazel is getting ready for her date with Gus is one of my favorites. She had packed two dresses: a white dress with red polka dots (featured above) and a green dress, but she ends up wearing the blue dress her mother bought her for their special night. 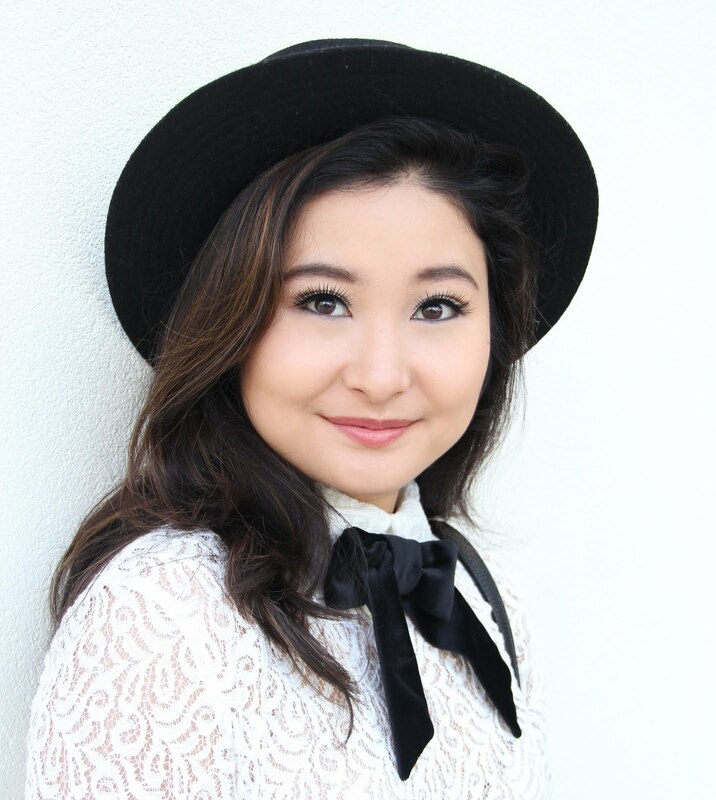 This is the first time we see Hazel putting effort into her appearance. Also, this is the first time she no longer wears the dark blue nail polish, which symbolizes her fully embracing life and not living as if the cancer is consuming her. On this "once in a lifetime" trip, Hazel gets to escape reality for a few days and truly live life instead of just going through the motions. The blue dress she wears on her first date with Gus looks absolutely stunning on her. It's a conservative style, which makes her look sophisticated and wise beyond her years (which she is), but the bright blue color keeps the dress looking youthful. 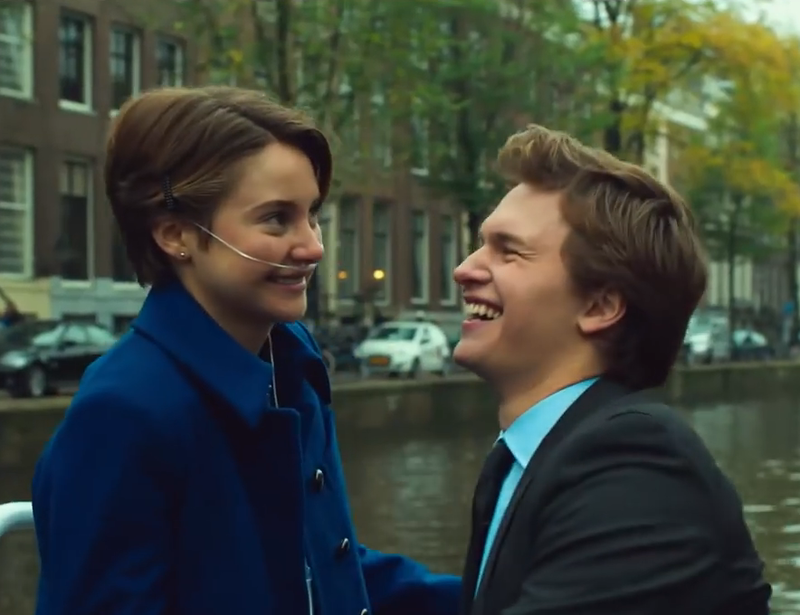 Before their romantic dinner at Oranjee, Gus and Hazel sightsee in Amsterdam and she wears this beautiful cobalt blue coat over her blue dress. 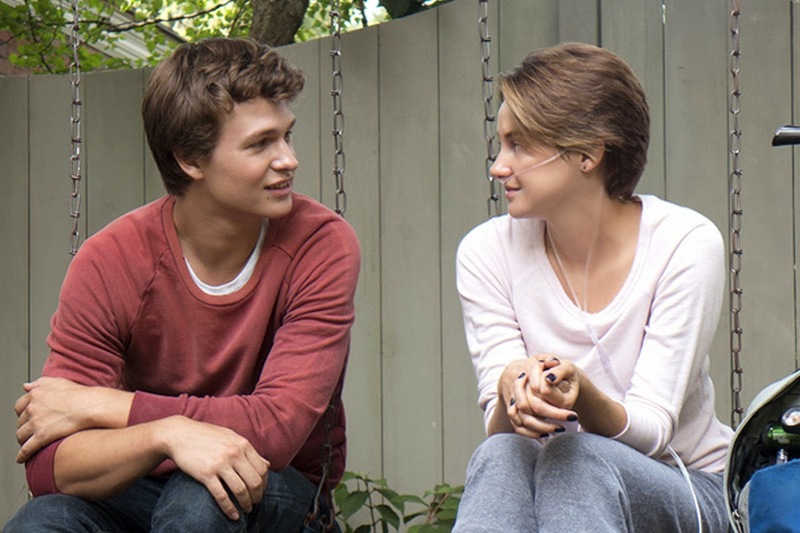 At this point in the movie, Hazel finally lets her guard down and begins to allow herself to see Gus as more than just a friend. The next day, they visit Peter Van Houten and Hazel wears an olive green jacket and a tongue-in-cheek shirt with a pipe on it as an ode to the main character in An Imperial Affliction. This shirt reflects Hazel's witty personality as well. The morning after they make love for the first time, Hazel wears a bright red pullover to breakfast. It's the first time we see Hazel in a vibrant color. Cliche as it may sound, the costume designer most likely chose red to symbolize her love for Augustus and the fact that she had finally given her heart to him despite her fear of being a "grenade" that "will obliterate everything in [her] wake." 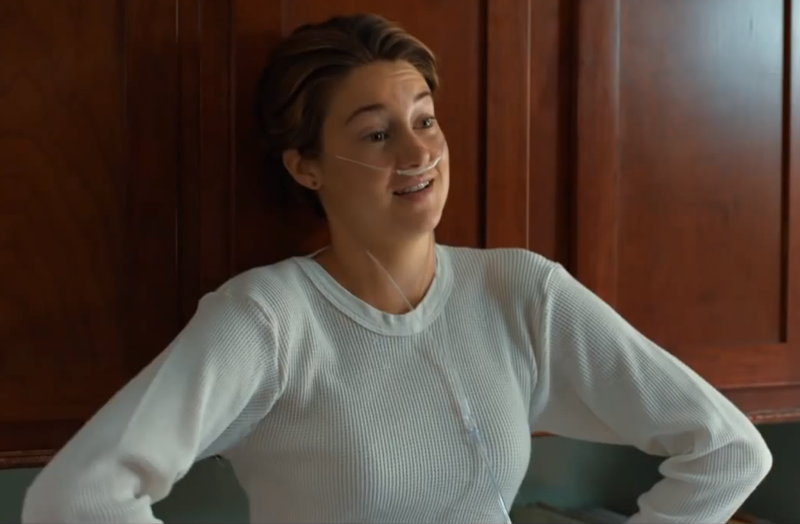 After Augustus tells Hazel that his cancer had returned with a vengeance, they return home and she reverts back to wearing light pastels and dull colors. At Augustus's funeral, Hazel wears a black dress that is reminiscent of the blue dress she wore on their first date. The hem of the dress has the same horizontal details as the blue dress, which I thought was a genius idea because it symbolized the fact she will always remember him and their memories from Amsterdam. It was a subtle detail, but it made all the difference. In the last scene of the movie, Hazel reads the eulogy Gus wrote for her and she lays down on the grass in a white lace dress and looks up at the stars above. 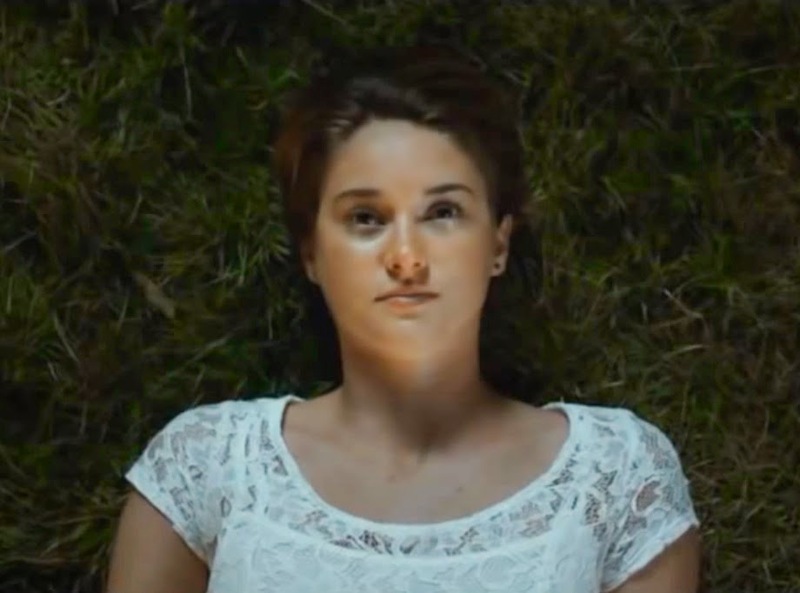 To me, the color white symbolizes that Hazel will continue to enjoy whatever time she has left, just as Gus had taught her. Also, I believe she accepts her destiny and is finally okay with the life she's been given. These are just my interpretations of the movie, so let me know in the comments below if you have seen The Fault in Our Stars and your opinions on Hazel's wardrobe. Sending you lots of love from my heart to yours! Sorry I took so long to reply to your comment. A lot of comments posted on my blog have been going to my email and not on my posts, so I finally figured out a way to fix it. Thank you so much for checking out my blog! I'm glad I provided you with what you were looking for. Thank you so much for checking it out and sharing it with your roommate! I am so happy you enjoyed it. I am really glad you liked it! Thanks for checking out my blog. Grеat bloɡ right here! Also ƴour site rather a lot up fast! I am using Blogger as my host and I purchased by domain name from Go Daddy. As for my affiliate hyperlink, I am not quite sure what that is or if I have one. Sorry about that. If you have any other questions, don't be afraid to ask me. I will do my best to answer them. Thank you so much for stopping by! I am glad my blog provided you with beneficial information. Thank you for your comment. 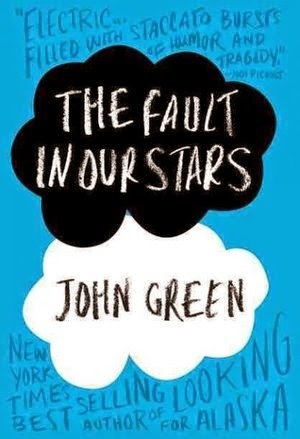 I am no expert, only a loyal fan of the Fault in Our Stars novel and movie. I am so glad you enjoyed this post! I am glad you liked this post. I hope to post more just like it in the near future, so stay tuned! Thank you so much for your comment. Feel free to comment on my blog anytime you want. Pretty great post. I simply stumbled upon your weblog and wished to mention that I've really loved surfing around your blog posts. Thank you so much for subscribing! I am so happy you enjoy my blog. wonderful submit, very informative. I'm wondering why the opposite experts of this sector don't notice this. you're actually a good webmaster. The site loading speed is incredible. Thank you so much for your sweet comment! I am not super tech-savvy, but I try my best. Truth be told, I had no idea that my blog was on Yahoo News. Thank you so much for telling me! I just started blogging about four months ago, so I am not sure exactly how my blog got listed on Yahoo News. I guess the only tips I can give you is to blog as much as you can (I try to post at least twice a week) and try to build up your social media profiles (I am still working at this). Hope that helps and thank you so much for checking out my blog! Thank you and I'm glad you enjoy reading my posts. As for other websites/blogs, I don't know of any fashion in movie blogs, but I can recommend a few fashion blogs: http://karlascloset.com and http://misskristurner.com. Hope you like them as much as I do! The movie was really good! I was so happy that it followed the book almost exactly, even the dialogue was spot on. The book gave me life and although the movie was good I saw some things personally that I would change. Thank you for your comment, John! I totally agree with you. There were a few things I would change, but I thought the movie did the book justice. The movie will be the stuff of truth and tragedy for some; for others, crafted schmaltz with an eye on the money. 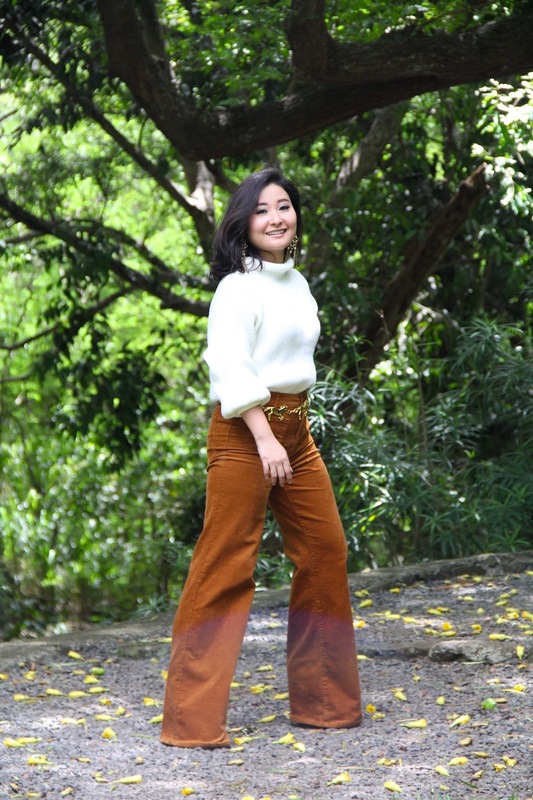 Hazel kept her clothes modest throughout the film and branches out style-wise and so those outfits suits her style so much. I enjoy your conclusion on this.